Hoisting a clandestine prime payload -- likely a pair of formation-flying ocean surveillance satellites -- and a menagerie of micro missions hitchhiking into space, the Atlas 5 rocket reeled off another successful performance Thursday in a rare mid-day launch from California. The 19-story rocket made its blastoff on 860,000 pounds of thrust heard and felt throughout the area, departing Vandenberg Air Force Base through a heavy marine layer draped over California's Central Coast at 2:39 p.m. (5:39 p.m. EDT; 2139 GMT). The flight continued the workman-like pace for United Launch Alliance, following yesterday's countdown dress rehearsal and fueling exercise back at Cape Canaveral on the next Delta 4 that will deploy a Global Positioning System satellite on Oct. 4, and the launch came the same day as Florida technicians began assembling the next Atlas 5 rocket to haul the Pentagon's X-37B spaceplane into orbit at the end of October. But producing the noise and fire this day was the Atlas from California, arcing over the Pacific on a "coast-hugger" trajectory, the RD-180 main engine powered by a highly refined kerosene fuel and supercold liquid oxygen propelled the rocket south-southeastward toward an orbit tilted 63 degrees relative to the equator. Five minutes into the ascent, the first stage was shed and the cryogenic Centaur upper stage with its venerable RL10 engine lit as the four-meter-diameter nose cone jettisoned. The rocket then flew into a total cloak of secrecy, the progress of its orbit shaping maneuvers and deployment of the wide-ranging cargos occurring outside of the public eye. Hours later, however, officials announced the launch had achieved a successful outcome. "Today's launch marks the fourth and final EELV mission for the NRO's Road to Launch 2012 accomplished in the last five months. This launch tempo is a tribute to all of the mission partners' dedication and continued focus on mission success -- one launch at a time." Atlas boosters have launched 615 times since 1957, and the Atlas 5 just celebrated 10 years of flight Aug. 21 with a record of 33 missions to orbit. 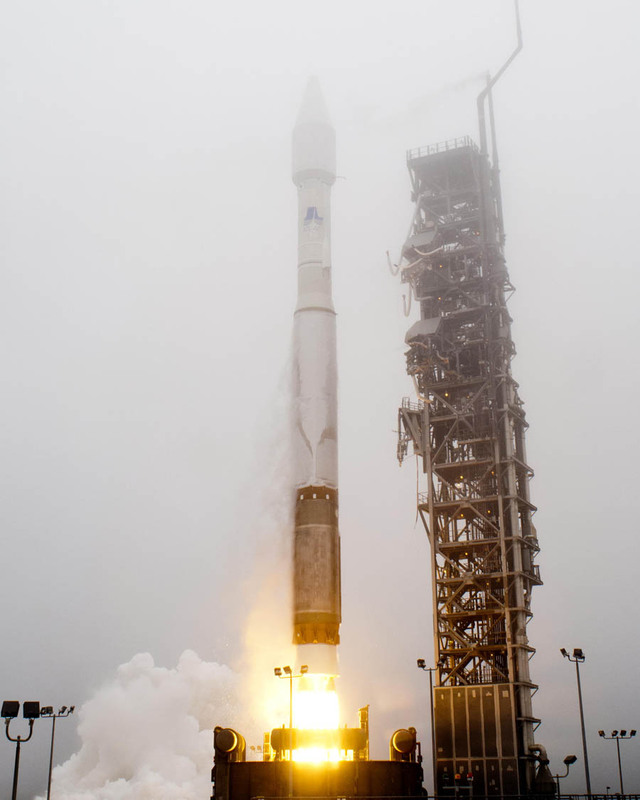 This was the fifth Atlas 5 to fly from the West Coast, all occurring successfully in the past four years to deliver national assets to orbit for the country's spy satellite agency and one mission with a U.S. military weather observatory. That frequent customer is the U.S. National Reconnaissance Office, the government organization responsible for designing and operating the intelligence-gathering surveillance spacecraft for policy makers and military forces. Satellite-tracking hobbyists believed Thursday's mission would launch two satellites for the NRO, just like a previous Atlas 5 from Vandenberg in April 2011, to further refresh the Naval Ocean Surveillance System, or NOSS. "NOSS satellites track ships at sea through their radio transmissions. The first two generations, launched between 1976 and 1996, consisted of several triplets that orbited in close formation. Analysis of the difference in time of arrival of a signal at each member of a triplet enabled determination of the location of the source. Third generation NOSS accomplish the same using pairs of satellites," said Ted Molczan, a respected monitor of spacecraft. Thursday's launch was expected to be the sixth for this current breed of NOSS featuring satellite duos instead of the previous trio arrangement. Atlas rockets have deployed this generation over the past decade beginning with two missions from Vandenberg that went up in 2001 and 2003 aboard Atlas 2AS vehicles, then two flights from Cape Canaveral that flew on the Atlas 3B in 2005 and an Atlas 5 in 2007, then the Vandenberg mission 17 months ago. It was unclear if the latest duo was replacing an aging set of satellites in the NOSS constellation or augmenting it. This was the fourth of four launches for the NRO in 2012. 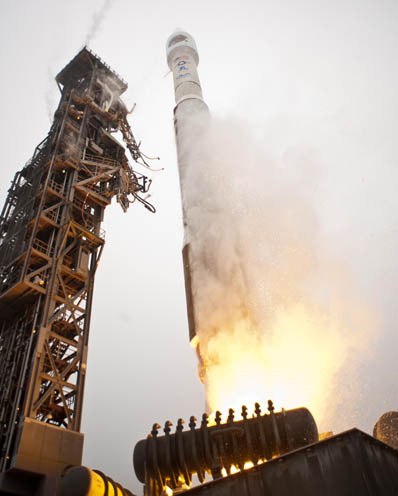 A Delta 4 put a radar-imaging satellite into a retrograde orbit from Vandenberg in April, an Atlas 5 carried a geosynchronous data-relay bird in June from Cape Canaveral, followed by a Delta 4-Heavy with a clandestine cargo also flown from the Cape in late June. 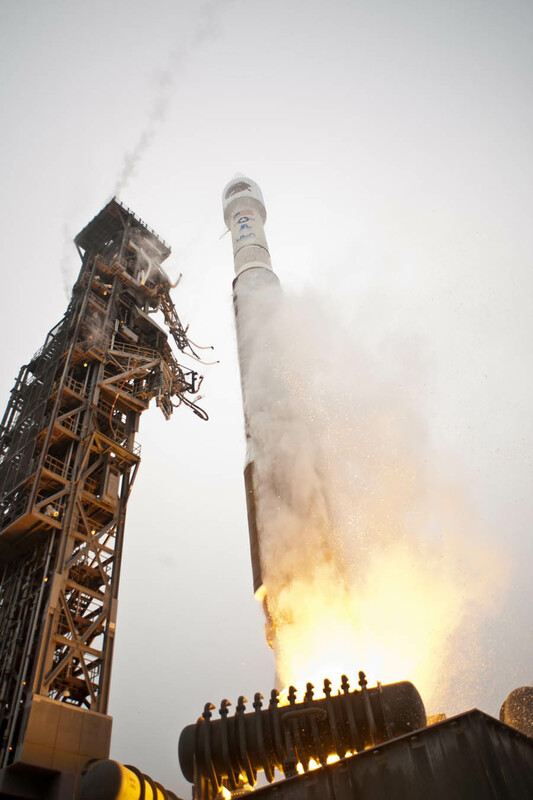 "Any NRO launch is critical to national security, delivering new intel capabilities out to the warfighters," said Lt. Col. Dan Gillen, commander of the 4th Space Launch Squadron that oversees Atlas 5 and Delta 4 rocket operations at Vandenberg. "Even though we are winding down some operations Afghanistan and Iraq, the need for intel is still growing." Once the Centaur deployed its primary payload, the upper stage maneuvered to a lower altitude where 11 miniature satellites built by universities, the military and a national lab were ejected from 8 deployers all packed into one box-like container built by the Naval Postgraduate School. That structure, dubbed the Operationally Unique Technologies Satellite, or OUTSat, rode on a bracket on the aft-end of the stage next to the RL10 engine where a helium bottle previously resided. "We have long recognized that there are benefits and efficiencies to be gained through rideshare in space launch," said Betty Sapp, director National Reconnaissance Office. "These benefits include opportunities to conduct scientific research and demonstrate and apply emerging technologies through the use of small satellites." Four flew through NASA's Educational Launch of Nanosatellite program that works with schools to give students real-life experience in the space business. Institutions launching their scientifically-meaningful hardware on this rocket via ELANA are the University of California, University of Colorado at Boulder, California Polytechnic State University and Morehead State. In addition, the NRO's Mission Support Directorate is enabling 7 satellites to fly from the Army Space and Missile Defense Command, the Aerospace Corp., the University of Southern California and the Lawrence Livermore National Laboratory. 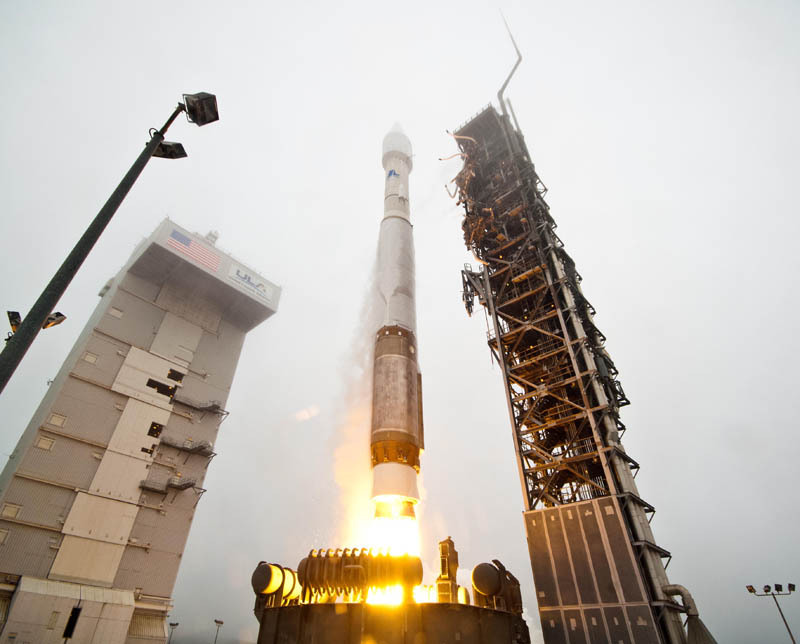 Next up for Vandenberg, the base will host two more Atlas 5 launches early in the year with a Landsat Earth-resources spacecraft on Feb. 11 at 10:04 a.m. local time, NASA says, and the commercial GeoEye 2 Earth-imaging satellite will follow in April. Justin Ray has been editor of Spaceflight Now since its inception in November 1999. The online website, based at Cape Canaveral, has documented U.S. and international space news with a specialty of live launch coverage. Prior to that, Justin worked for two years as an aerospace reporter at the Florida Today newspaper and its pioneering Space Online website. He began his career as an intern at Patrick Air Force Base's public affairs office in 1996 and wrote for the Missileer base newspaper. The Ohio native has covered more than 115 Delta rocket launches, 85 Atlas flights, 65 space shuttle missions and construction of the International Space Station, plus scientific spacecraft such as the Mars rovers and Cassini. He attended college at the University of Central Florida and now resides in Viera, Florida.